I've been in organization mode recently and over the long weekend I took some time to organize a few messy kitchen drawers as well as my disorganized hall coat closet. I like keeping my handbags in the hall closet downstairs, but it's been looking messy lately. I tried standing the bags upright neatly next to each other, but the smaller ones tend to fall over and everything gets out of place whenever I reach for a bag. I finally wised up and came up with a very simple and easy solution. I put all of the small bags into little cube storage containers. 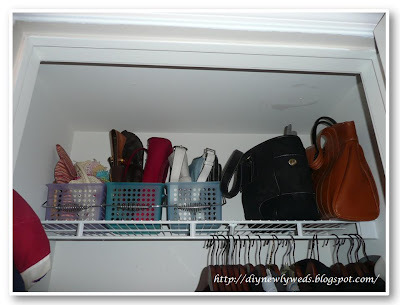 About 2-3 handbags can neatly fit into each plastic container. The container holds the bag upright and in place. Now, when I reach for a bag I just need to take out the right container and grab the bag I need without toppling the others over. 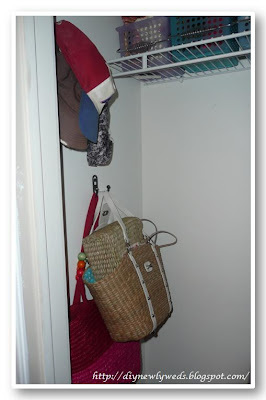 For my large summer handbags, I added a large extra coat hook onto the closet wall. 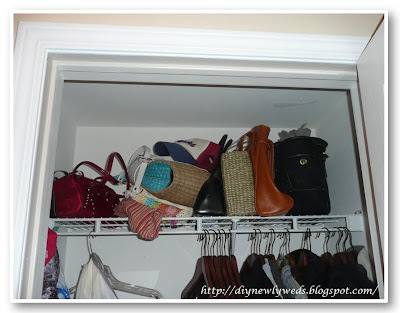 This is perfect for storing over sized bags that are too big to fit on the closet shelf. And don't worry, once summer is over I'll have plenty of large fall/winter bags to keep there! Wow - what a good idea with the hooks! And with as colorful and some of my purses are, it might could double as wall art in my craft/spare bed room!